John was baptised at the Collegiate Church, Manchester on 3rd June 1714. At some stage John went to London and had a warehouse business in St Michael's, Wood Street, London. On 19th May 1743, he married Elizabeth Barrett, a spinster of Banbury, by Licence of Wickham. From soon after the marriage until his death, John lived in Worcester. The Parish Meeting and Order Book of St Peter the Great, Worcester reveal John's signature first appearing on November 1st 1750. His signature does not appear again until the Annual meeting of April 20th 1756, which confirms John as Churchwarden with a Thomas Peace. John signs on many other occasions in 1756 and 1757. He does not appear again until the April meeting of 1760 when he simply signs the minutes.
" Mr William Ellis, William Oliver, George Hill, and John Gaskell elected Guardians of the poor for the city of Worcester for the Parish of St Peter" John signs below. He signs the minutes of the AGM on April 21st 1763 and throughout that year. Throughout 1764 John signs as "Overseer for the City". There are no further entries. John rented a farm at Batten Hall, Worcester where his family lived for some time after his death. NB I am very fenfible of its being incumbent on me to make a perfonal Return of Thanks for the many Favours I have received; but, as yet, my extreme illnefs will not admit of it." * No Writings, Bills, Money, Jewels, Plate or any other articles of particular Value, will be taken in charge or anfwered for (if left) unlefs entered as fuch, and paid for accordingly." There were similar advertisements in the issues of Thursday 19th and 26th December 1765. The dates of the advertisements were:- John - 17th December: Elias - 18th December. In April and May 1766 there were further advertisements by Elias, the first simply advertising his business and referring to the assignment from John; the latter referring to a change of timetable and to John as “the late”. 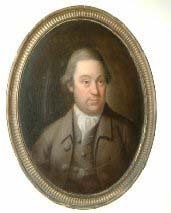 John died on Sunday, 27th April 1766 and was buried on 30th April in St Peter’s, Worcester. John's will was dated 21st April 1766. The executors were - “my friend James Nash and my loving wife Elizabeth”. John "Weak and infirm in body but of sound mind, memory and understanding." To Elizabeth - My three freehold Mesuages (land for development) or Tenements with the Buildings, Lands, Hereditaments and Appurtenants in the Parish of St Peter in the City of Worcester occupied by myself and my undertenants George Ireland and Isaac Pemberton. This bequest is for the duration of Elizabeth's life. In the event of her death, John bequeaths all above to his friends - James Nash of Besford, Worcestershire, Gentleman and William Salmon of the Parish of St Michael in Bedwardine, Worcestershire, Bruke Maker(?) - to hold upon Trust; managing and taking the rents, issues and profits to use as they see fit for the education and maintenance of his five children Thomas, John, Elizabeth, William and George until they reach the age of 21 or marry. To the children - on reaching 21 and after Elizabeth's death, all above to be shared equally between those surviving and the issue of any not surviving. To Elizabeth also - "The Benefit and advantage of the lease of my Farm at Battenhall, which I rent of Sir John Seabright, Baronet, Situate and being in the Parish of Saint Peter" with the use of the stock of grain, hay, cattle and implements of husbandry, during her life. Thereafter, to be divided between the children as Elizabeth sees fit. To the children - £100 at 21 (£8140 in money of 2002), but to be shared, as above, on the death of one or more. To Elizabeth - The rent, residue and remainder of "my Goods, Chattels, Book debts and Securities for Money and other my personal estate" after payment of debts etc. The will was proved on 13th May 1766 by Elizabeth Gaskell. A document was attached to the will which confirms certain information about John’s children. The books relating to St Peter The Great are held at The Worcester County Record Office, St Helen’s. The Newspaper Advertisements were viewed at Worcester City Library." All copies to June 1766 and backwards to June 3rd 1756 were checked but no further references to John nor his business were found. The will is located at the Family Records Centre in London and the “Case” at St Helen’s, Worcester.